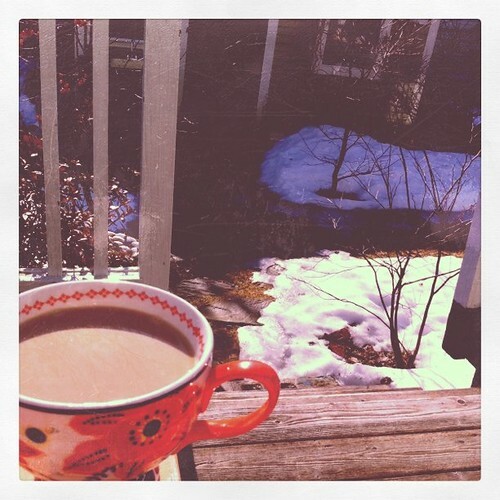 I had my cup of coffee out on the deck for the first time this year. The moment I stepped out, the cardinals burst into loud, joyful song, like they were happy to have me around again and were ready to share this almost-spring day with me. Today we are spiffing up the house for Olivia's party with her friends this afternoon. We will celebrate our firstborn's fourteen years walking this earth tomorrow. I feel about to burst with song, like the cardinals, just being able to be with her and know her. My promise to her is that when I feel my tremendous love for her welling up and threatening to overflow in tears, I will try, my darling girl, to sing instead.